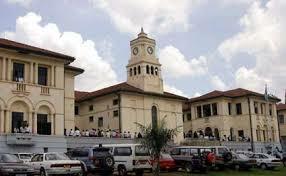 Officers met on the grounds of the High Court building in Kampala this morning agreed to call off the judiciary strike. PML Daily picture. Judicial officers early this afternoon unanimously resolved to end their nearly two-week long strike and return to the courtrooms. Government business including police work has been paralysed during the period of the crippling strike. Police cells were overflowing with inmates on remand who could not be processed and at least one jail-break was reported as a consequence. The decision to return to work was arrived at during a Uganda Judicial Officers Association meeting held at the high court. It was agreed that the industrial action be deferred to December 11 as they give the government time to work on their salary enhancement demands. Judges magistrates, state attorneys, court registrars and other officers threw off their robes and ceremonial wigs August 25 protesting low salaries compared to officers in the two other arms of government. They also decried the poor benefits and working conditions like lack of cars and operational funds. President of UJOA Godfery Kaweesa rallied the officers this afternoon and urged them to return to work while the government goes about fulfilling their demands. “Colleagues I urge you that after our lunch let us return to work so that we execute our mandate,” Kaweesa said. He said it has been agreed that salary reviews will be in place by November. 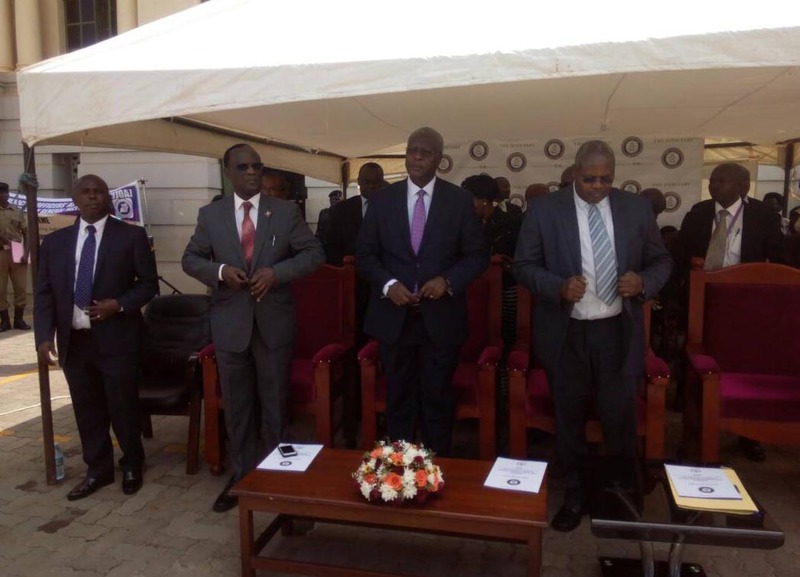 Chief Justice Bart Katureebe, (centre) his outgoing deputy, Steven Kavuma (left) and Principal Judge Yorokamu Bamwine at today’s assembly of judicial officers. Photo by Vincent Kasozi. Chief Justice Bart Katureebe applauded the judicial officers for taking the bold decision to lay down their tools in protest against the continued marginalisation of the Judiciary. History will record that it was during his tenure that longstanding demands for better pay on the bench received the full attention of government. Katureebe who was sitting near Justice Minister Kahinda Otaffire informed the gathering that their sit-out has proved that improvingthe attitude of working and personal conditions of judicial officers is paramount. The Chief Justice also decried the attitude of some forces in the other two arms of government; the Executive and Parliament which he said frustrate Judiciary and unfairly encumber it with low budgetary allocations. “Indeed, the Judiciary is a co-equal arm of government with the other two, but as someone stated somewhere else the Judiciary neither controls the purse nor the sword,” Katureebe lamented. Justice and Constitutional Affairs minister Kahinda Otafiire said he will present the Administration of Justice Bill to Cabinet this Friday for approval. This piece of legislation seeks to provide for and strengthen the independence of the Judiciary, including providing for enhanced remuneration. The finance ministry, it appears, had delayed the Bill by holding onto the ‘Certificate of Financial Implications’, a key instrument without which bills can’t get onto the floor in Parliament. Strangely enough, under the current government bureaucracy the Judiciary sometimes finds itself placed under the Ministry of Public Service for certain services like pay, which in essence puts it under the Executive arm of government – a constitutional oddity.